More than sixty years have passed since Israel started its nuclear venture and almost half a century has elapsed since it crossed the nuclear weapons threshold. Yet Israel's nuclear history still lacks a voice of its own: Israel has never issued an authorized and official nuclear history; no insiders have ever been authorized to tell the story from within. Unlike all seven other nuclear weapons states, Israel's nuclear policy is essentially one of non-acknowledgement. Israel believes that nuclear silence is golden, referring to its nuclear code of conduct as the policy of amimut (the word means opacity in Hebrew). In a sense, amimut is the overall public trademark of Israel's bargain with the bomb. It combines secrecy, ambiguity and taboo. Consequently, researching Israel's nuclear history poses enormous challenges. I vividly recall how both Israel Dostrovsky and Shalheveth Freier — the second and the third heads of the Israeli Atomic Nuclear Commission (IAEC) — told me one time that it would be impossible to narrate the history of the Israeli nuclear project for the deeds of that history simply "resist" the written record. When the 1973 Yom Kippur War broke out, Freier (so he told me) as the head of the nuclear agency ordered his subordinates to stop communicating with anyone in writing. In accordance with this policy, Israel keeps the IAEC archives totally sealed. 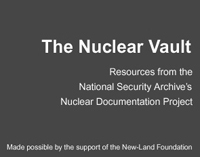 Virtually no Israeli state archival documents that reveal interest in nuclear weapons are publicly available. Given the United States' own role in this policy — practically it is a joint policy of both states to which the United States plays a guardian role — the U.S. government — whose archive is often used as a back door into the records of other nations — treats its Israeli nuclear files in a very special way. Specifically, consistent with and in support of the Israeli policy of amimut, the United States does not declassify any material that affirmatively implies US factual knowledge that Israel is a nuclear weapons state. The result is that significant elements of the American record on Israel's nuclear program remain classified, hence, unavailable. A similar pattern appears to exist in other Western states that also have ties to Israel's nuclear history, such as France, the United Kingdom, Norway, and Germany. Yet, as collusive and troublesome as the U.S. government's relationship with Israel's nuclear program may be, the U.S. official record on the subject is not a complete black hole. U.S. government officials wrote and sent telegrams, intelligence reports, memoranda for the record, and participated in discussions for which they prepared memoranda of conversation. This long paper trail ended up in the archival records of government agencies, including the White House, and consequently much of this material has been released following routine declassification review process at the National Archives and presidential libraries. Of course, some documents still remain beyond reach for the time being because they include policy decisions and/or intelligence material which the U.S. government deems extremely sensitive or simply inconsistent with its role in that joint policy. For nearly three decades I have been committed to the effort to track, research and record Israel's nuclear history to the extent possible. Declassified U.S. government records played a central role in the research I conducted for the two books that I have written on the subject, Israel and the Bomb (1998) and The Worst-Kept Secret: Israel's Bargain with the Bomb (2010). As part of that work I have sought to make the most valuable items of the declassified record as open as possible. Toward that end, for over fifteen years I have worked (and now as a professor at the Middlebury Institute of International Studies at Monterey) closely with the National Security Archive to identify important documents and new or hitherto obscure archival sources. In 1998, with the publication of Israel and the Bomb, the Archive and I jointly launched a special Web posting as a documentary companion to the book. A colleague and senior staffer at the Archive, William Burr, has also been deeply interested in the challenges that the Israeli nuclear program has posed for U.S. nonproliferation policy. Over the years he has made numerous requests to open the classified record at the National Archives and presidential libraries. The two of us have co-edited a number of Electronic Briefing Books on the Archive's Web site and published several articles on key moments of U.S. -Israel nuclear history. Because of the importance of the Israeli nuclear program to the Archive's continuing work on the history of nuclear proliferation and nonproliferation policy, the Archive is dedicating a special Web site to this subject, to be called "Israeli Nuclear History" as an integral part of the Archive's Nuclear Vault. The Archive and I will be jointly responsible for the content of this new project whose purpose will be to encourage open research and thinking on Israeli nuclear affairs in a responsible and scholarly fashion. The new "Israeli Nuclear History" will incorporate under one roof and in one unified format the old "Israel and the Bomb" web site with new material as well as all the earlier Electronic Briefing Books that William Burr and I have put together. In the coming years, the National Security Archive and the Middlebury Institute of International Studies at Monterey are committed to publishing more collections of primary sources on the Israeli nuclear program. The great majority of them will be of declassified U.S. documents. However, we will have also some material in Hebrew, material that I have collected over the years and which will shed light on the various phases of Israel and the bomb. The overall goal of "Israeli Nuclear History" is to serve as a guide to the past and also to enlighten our understanding of the present and help shape a more peaceful future. Historical scholarship on Israel's nuclear program affects contemporary thinking on nuclear matters in the Middle East and globally. Greater public knowledge of Israel's nuclear policies is critical to the country's continued ability to flourish as a vibrant democracy. Moreover, historical transparency may help promote regional stability by reducing distrust between Israel and its neighbors. For a significant exception, see a declassified Special National Intelligence Estimate from 1974 which confirmed Israel's nuclear weapons status. Avner Cohen, widely known for his path-breaking historical work on the Israeli nuclear program, is an internationally recognized author and expert on nonproliferation issues in the Middle East. A consultant to a range of NGOs and governmental agencies, Dr. Cohen is affiliated with the Middlebury Institute of International studies at Monterey as Senior Fellow at the James Martin Center for Nonproliferation Studies (CNS), Director of the CNS Nonproliferation Education Program, and Professor in the Graduate School of International Policy and Management. Previously Professor Cohen served as a Public Policy Scholar at the Woodrow Wilson International Center for Scholars (2009-2010) and held a ten-year affiliation with the Center for International and Security Studies (CISSM) at the University of Maryland. Avner Cohen is a two-time winner of prestigious MacArthur Foundation research and writing awards, in 1990 and 2004, and in 1997-98 and 2007-08, was a Senior Fellow at the United States Institute of Peace (USIP). In addition, he was co-director of the Project on Nuclear Arms Control in the Middle East at the Security Studies Program at MIT from 1990 to 1995. 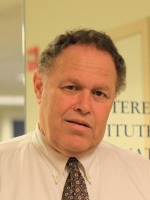 Avner Cohen has been a visiting professor at a number of U.S. universities, and in 2005, was Forchheimer Visiting Professor at the Hebrew University. Professor Cohen is the co-editor of Nuclear Weapons and the Future of Humanity (1986) and The Institution of Philosophy (1989), and author of The Nuclear Age as Moral History (in Hebrew, 1989). His most acclaimed book, Israel and the Bomb, was published in 1998 in English and in 2000 in Hebrew. His latest work, The Worst Kept Secret: Israel's Bargain with the Bomb, was published in 2010 by Columbia University Press. Avner Cohen holds a B.A. in Philosophy and History from Tel Aviv University, an M.A. in Philosophy from York University, and a Ph.D. from the Committee on History of Culture of the University of Chicago (1981).